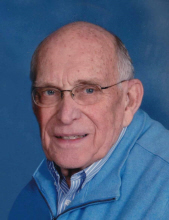 Mr. Denis Rons, age 85, of Orange City, passed away on Tuesday, February 5, 2019, at the Orange City Area Health System. There will be a memorial service on Tuesday, February 12, at 10:00am, at the Oolman Funeral Home in Orange City. The Rev. Michael Hardeman will officiate. Interment will be at a later date at the West Lawn Cemetery in Orange City. Denis Gene was born on May 12, 1933, in Sioux Center, the son of Peter W. and Johanna Edna (De Pree) Rons. He was raised in Sioux Center, where he graduated from the Sioux Center Public School in 1951. While in school, he helped at his father’s business, Ron’s Motor Sales. On November 16, 1956, he married Marlene Jane Oordt at the Second Christian Reformed Church in Orange City. In 1963, he graduated from the Arizona State University, with a Bachelor of Science degree in Business Marketing. While in Arizona, he worked for the General Electric Company, in the Computer Division and Marketing Research Department. Denis and Marlene moved to Orange City in 1968, and established Rons Motor Sales, a Ford and Mercury dealer franchise. They were members of the American Reformed Church, where he was a member of the greater consistory. He was also a member of the Orange City Chamber of Commerce, the Orange City Chamber of Commerce Board, the Orange City Tulip Festival Steering Committee, a charter member of the Orange City Dutch Heritage boosters, and various automobile dealer organizations including the IADA, NADA, and FDA. He enjoyed traveling to the four corners of the country, connecting with family along the way, and traveling internationally including a trip to the Netherlands in 1991. He also loved annual family get togethers, especially Christmas. He liked to know how things worked, which led to an interest in wood working, mechanics, and the new world of technology. He marveled at nature in all its glory and seasons and the amazing diversity of plants, animals, and insects. Survivors include his wife of more than 62 years; a son and his wife, Timothy Jay and Tammy (Webster) Rons, of Ames; and two brother and their wives, Francis Earl and Harriet Rons, and Jan Peter and Carole Rons. Memorials may be directed to the American Reformed Church. To send flowers or a remembrance gift to the family of Denis G. Rons, please visit our Tribute Store. "Email Address" would like to share the life celebration of Denis G. Rons. Click on the "link" to go to share a favorite memory or leave a condolence message for the family.